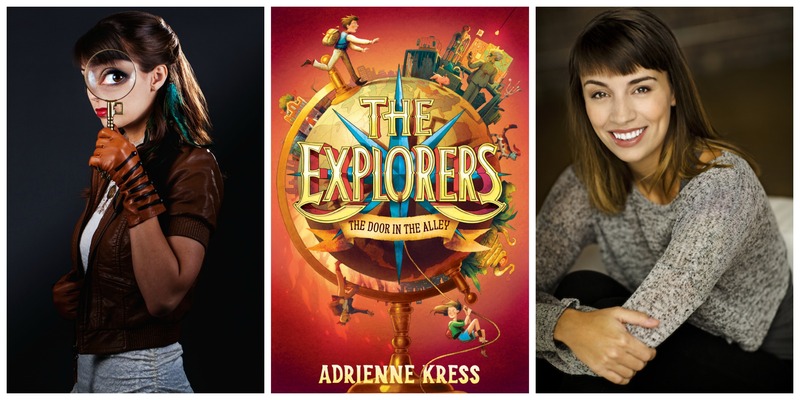 Today I am honored to welcome Adrienne Kress. She is the author of the newly released action-adventure mystery called The Explorers: The Door in the Alley. And in our conversation we chat about traveling, the difference between writing Young Adult vs. Middle Grade, and high tea. Take a listen. A few weeks ago as I was preparing to read The Explorers and I knew we would be chatting, I hopped on your website and whoa! You are a woman of many talents – not only an author but an actor, a playwright, producer/director… How do those roles all work together? What is your day like? I was reading your bio section in the back of the book and you mention that both of your parents are English teachers and yet I read an article where you described yourself as a reluctant reader as a child. What was that like for you? Let’s talk about The Explorers ! Your middle grade book is coming out Tuesday, April 25th. Tell us what it’s about! I am excited to get the final version and see the artwork – not only how the artist envisioned the characters and setting, but I was really intrigued by the placement on the pages… Can you tell a bit about that process? One of the things that fascinated me about The Explorers Society with the huge multi-floor library built around this giant tree and rooms dedicated to the interests of the explorers. One person explores deserts and one focuses on leaves and another one is interested in sewers. If you were to join the Explorers Society, what would you dedicate your life to exploring? Not only do you write middle grade books, but you also have YA books out as well. When you set out to write a book, do you already know ahead of time whether it will be Young Adult or Middle Grade? What is that process like for you? What is your reading life like now? What have you read lately that you’ve really liked? In this section of the show, I share with you three books centered around a theme and discuss three things to love about each book. This week we are focusing on stories about amazing people – both historical and modern. They are Good Night Stories for Rebel Girls, Who Wins? 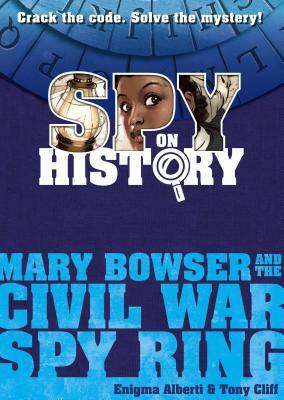 100 Historical Figures Go Head-to Head, and Spy on History: Mary Bowser and the Civil War Spy Ring. How each one-page biography is written like a mini fairy tale. It’s such a different take on a biography compilation. Let me give you a few examples: “Once there was a little girl who didn’t speak for five years. She thought her words could hurt people and promised herself to never make a peep again. Her name was Maya.” That’s Maya Angelou. Here’s another one. “Once there was a girl who wanted to drive a car. She lived in Saudi Arabia, a country where religious rules forbid women from driving. One day she decided to break the rules.” – That’s Manal Al-Sharif, the women’s rights activist. I just love them – and there’s something about telling these women’s stories like this that elevates them to a heroic level and makes you feel like you can slay your own dragons. The variety of stories and the women you get to learn about. For instance, the book includes artists like Frida Kahlo and Coco Chanel but also tattoo artist Maud Stevens Wagner. There are well-known political figures like Michelle Obama, Hillary Clinton, and Evita Peron but we also get know about Somali politician Fadumo Dayib and Indian Queen and Warrior Lakshmi Bai. There are mathematicians, and surgeons, and drummers, and spies, and chefs, and mountaineers, and one elementary school student – Coy Mathis, born in 2007. And I’ll leave her story for you to discover. And finally – at the very end there is a place to write your own story and draw your own portrait. How powerful is that? 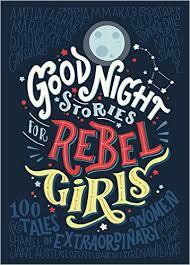 Goodnight Stories for Rebel Girls would be a great gift – especially for girls, but could absolutely be enlightening for boys as well. 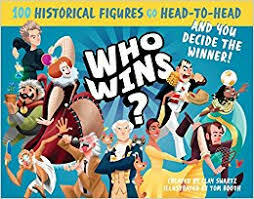 As I was reading some to my daughters, I had my teacher hat partially on and was thinking that this would be great for Women’s History Month next year. We could read one brief story every day and expand our knowledge of some women who should be known and celebrated for their accomplishments. You – and your kids – are never going to get bored with this book! There are 100,000 possible combinations, and I can attest that with my own kids, the conversation starts with the match-up and then spirals into discussing other situations. And did I mention? It’s full color!! It’s gorgeous and really designed well. The three panels are not just basic rectangles – they are done in a zig-zag pattern that somehow keeps the pages from sliding over each other too much. They nestle together. The potential to springboard some cool projects and discussions off this book! Again, I’ve always got my teacher hat on and I kept thinking that it would be really cool to act some of these out. Thomas Edison vs. Mother Teresa in a Hot Dog Eating Contest! Or… if your school is like mine, we often have a biography unit. Perhaps your students could take their biography subject and give them a rating in a few categories and have them face off in different situations. And it doesn’t have to be a lengthy thing, maybe just a quick find a partner and “Okay, Who would do better living on a desert island? You’ve got two minutes to chat and back up your ideas.” Or – for your own children, this would be the perfect book to stash in your car. The interactive part. Readers actually get to solve a mystery in this book! It comes with spycraft materials like a cipher wheel, red acetate paper, and a white vellum sheet that when you line it up correctly can be used to help crack the code on certain pages. It is SO cool! And comes with a sealed answer key if you get stuck. How this book angles history from the perspective of a black enslaved woman. History is told by those in power and for far too long, we have been denied the point of view of most women and most people of color, and I am so glad children get a chance to meet and know Mary Bowser. And finally, what I liked most about this book was that I couldn’t read it. Now, what I mean by that is that I attempted to read it, but it very quickly got snatched out of my hands. I started reading on the couch and as soon as the words, “OOOoooo…there’s codes in this…” came out of my mouth, my daughters were huddled behind me reading over both my shoulders. Then… they climbed over the back of the couch and into my lap to “help” me flip through the pages. And then they saw the grid of letters and snatched it away to go solve it without me! Argh! Mary Bowser and the Civil War Spy Ring is a little bit like a combination of a Mail Order Mystery and Nathan Hale’s Hazardous Tales. If you know a kid who loves a mystery, who loves cracking a code, who loves a suspenseful story – then this one is a winner. A couple quick announcements before we close today. I’ve skipped the Question & Answer segment the last couple of weeks mainly because I didn’t want to have the episodes run too long. I know several of you have sent questions. Thank you! And I’ll be back on track answering those next time. Also – I discovered new website for you to check out! It’s teacherswhoread.blogspot.com It just launched a few weeks ago and it’s a great site if you’re looking for more middle book recommendations or engaging literacy ideas to try out in your school. Alright – that’s it for our show this week. If you have a question about how to connect middle grade readers to books they will love or an idea about a guest we should have or a topic we should cover, I really love to hear from you. You can email me at booksbetween@gmail.com or message me on Twitter/Instagram at the handle @Books_Between. Thank you so much for joining me this week. You can get find an outline of interviews and a full transcript of all the other parts of the show along all of our previous episodes at AlltheWonders.com. And, if you are liking the show, please help others find us too by telling a friend, sharing on social media, or leaving a rating on iTunes or Stitcher.